Everyone knows I am a huge Disney fan, but I am also an eternal fan of all things Dr. Seuss. Dr. Seuss has inspired me as a child, and continues to motivate me as an adult. 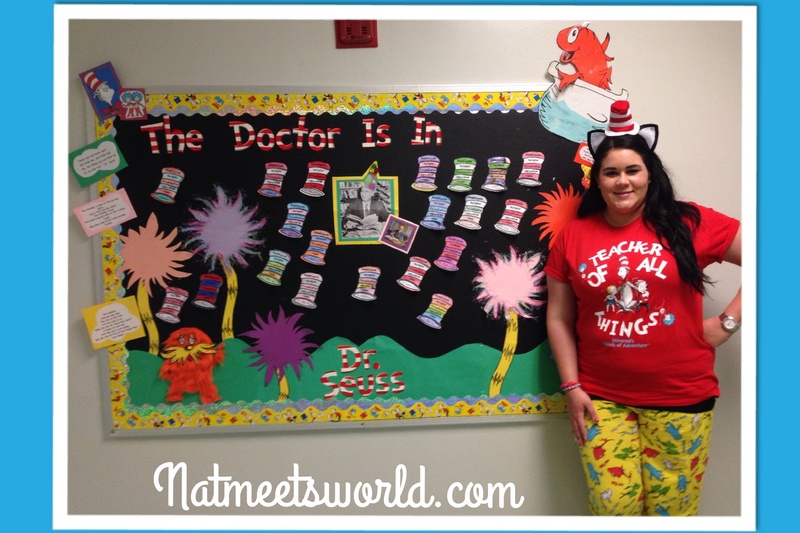 I love reading Dr. Seuss’ books to my students and seeing their imaginations run wild with his stories. March 2nd was Dr. Seuss’ birthday, and I always go all out with my little love bugs. I start the day off with green eggs and ham (yes, I make them at home but tell them that Sam I am dropped them off for me to share with them LOL). After that, we discuss Dr. Seuss’ life and success stories that inspire the kids to become whatever they want to be when they grow up. Since Dr. Seuss’ birthday is on Read Across America Day, we also spend the day reading and interpreting his books and take Accelerated Reader (AR) tests and compete with the entire nation to read the most books. Later in the day we watch Horton Hears A Who and The Lorax, and enjoy it while drinking moose juice and goose juice. This year, I added a little more fun to the event by making cupcakes. I decided to go with a funfetti cake (after all, we are celebrating a birthday) with a blue vanilla buttercream frosting. They looked plain to me, but instead of putting on colorful sprinkles, I decided to replicate the famous Cat In The Hat hat. 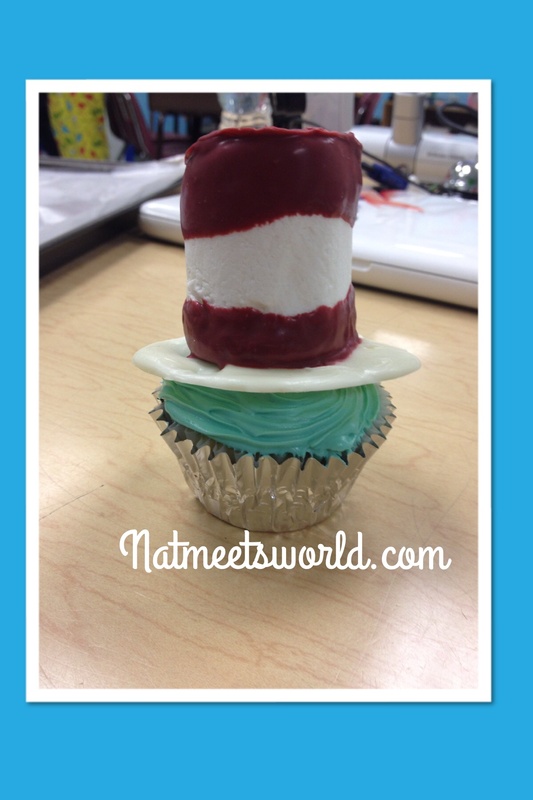 Even though Dr. Seuss’ birthday is over, it doesn’t mean you can’t make these for a Dr. Seuss themed birthday party or baby shower! 1. Melt the white candy melts first. Once completely melted, use your cookie dough scooper to scoop out the candy melt and pour it onto your wax paper. You will need to quickly make a circle with it after you lay it down (see picture below). You will need one circle per cupcake you bake. I recommend making a few extra in case you break one later. Set aside to cool. 2. 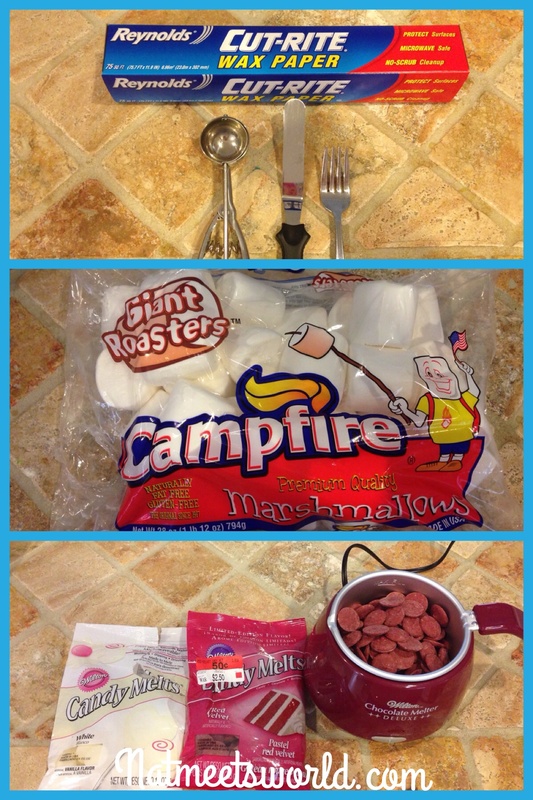 Next, skewer your marshmallows and melt the red candy melts. (I purchased red velvet candy melts because I love the taste of red velvet and love that they were on clearance for fifty cents even more. After making the marshmallows however, I wish I would have gotten the regular red candy melts because the red velvet color was a darker red than I wanted). Once the red candy melts are melted, dip your marshmallow 1/4 of the way in and lift slowly. You will need to use your offset spatula to smooth out the candy melt over the marshmallow, and remove excess candy melt that sticks to the marshmallow. You will want a thin layer. I twirled the skewer with my left hand while smoothing it out with my right hand. The hardest part about this step is making sure your lines are straight. Some of the marshmallows have creases and markings which can make this difficult. Try to do it the best you can. I am a perfectionist, so I was getting frustrated with my lines bing crooked, but I have to say, they did not look so bad. they looked very ‘cartoony’ and as you know, Dr. Seuss illustrations have a lot of crooked lines, so it went well with the theme anyways. 3. 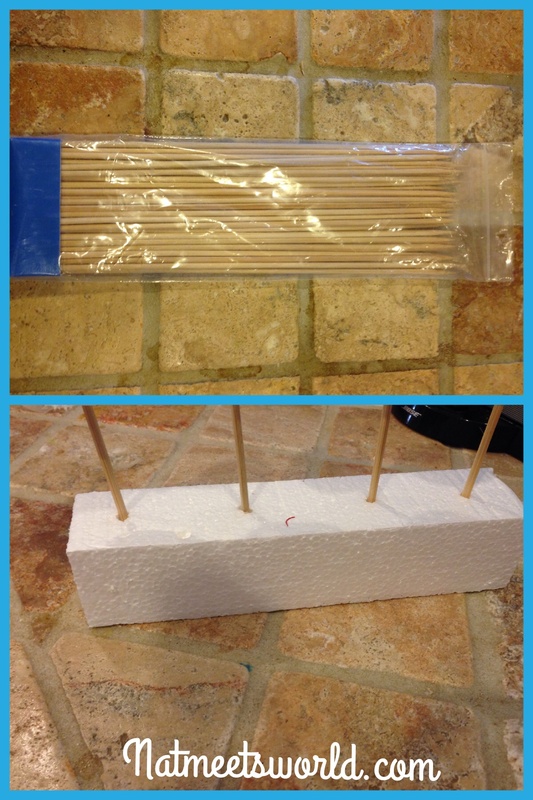 Once you have shaped the candy melt on the marshmallow, stick your skewer in the styrofoam. This will hold your marshmallows while you work on the others. 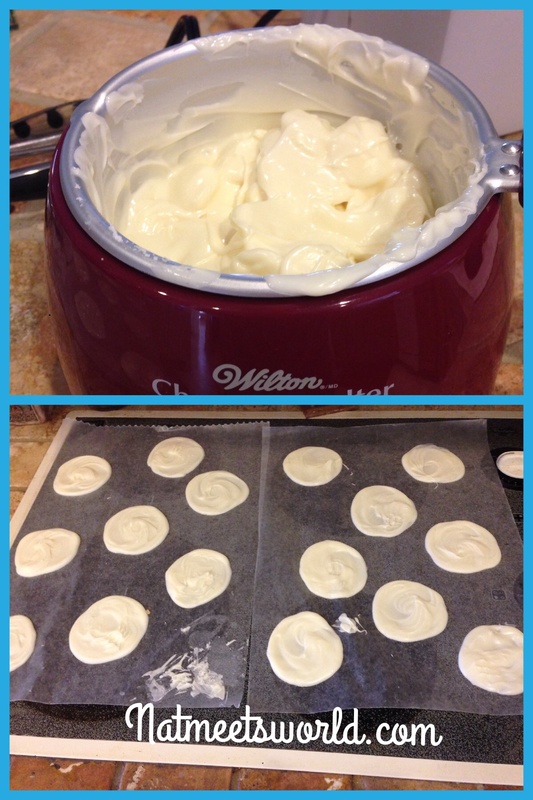 One thing that helped me was smoothing out the candy melts in the pot between each marshmallow that I dipped. It helped to make it smooth and easy. 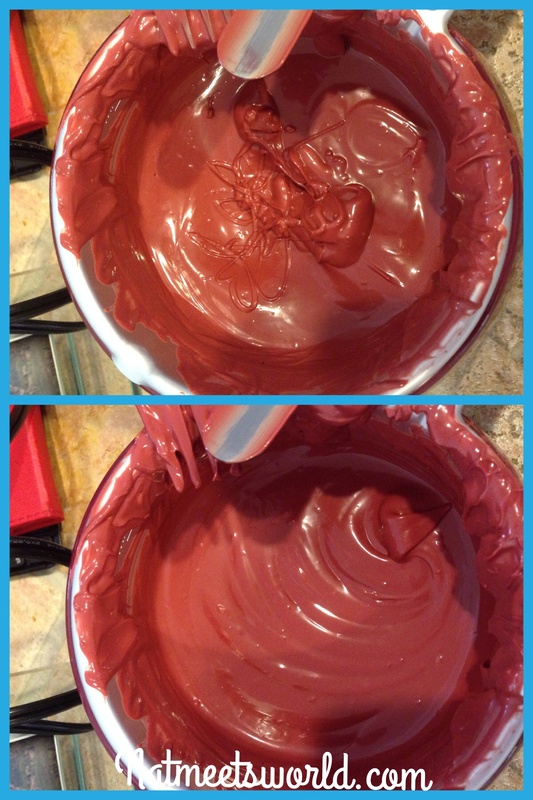 The picture below demonstrates how the candy melts looked after removing the dipped marshmallow, and the picture beneath that shows what it looks like after I smoothed it out by stirring it with a fork. Once all of your marshmallows are in your styrofoam, put it in the refrigerator until it hardens. Then, remove from the refrigerator to complete the hat. 4. Remove the skewer from your marshmallow and keep your white candy melt circles close by as you will need them to complete the hat. 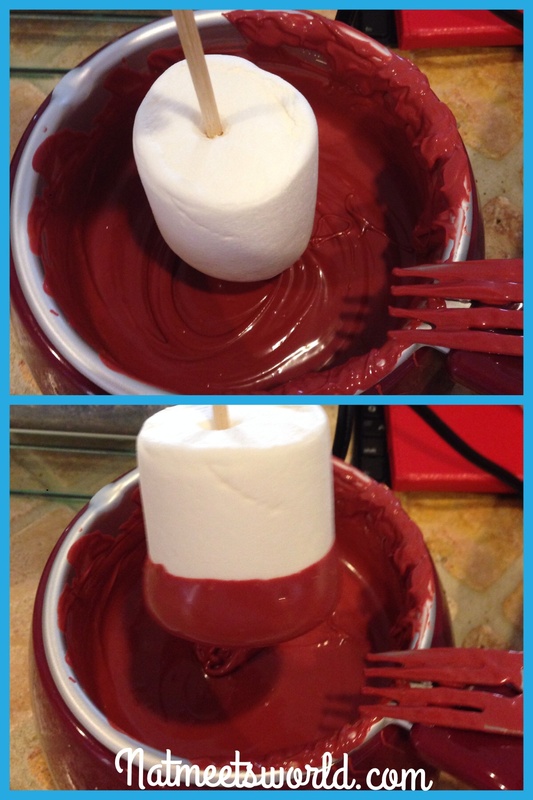 Hold your marshmallow from the already dipped side and dip it into the red melted candy melts. Use your offset spatula to make the clean lines (if you would like to). Make sure you have a tiny extra candy melt at the bottom so that it sticks to the white circles easily. 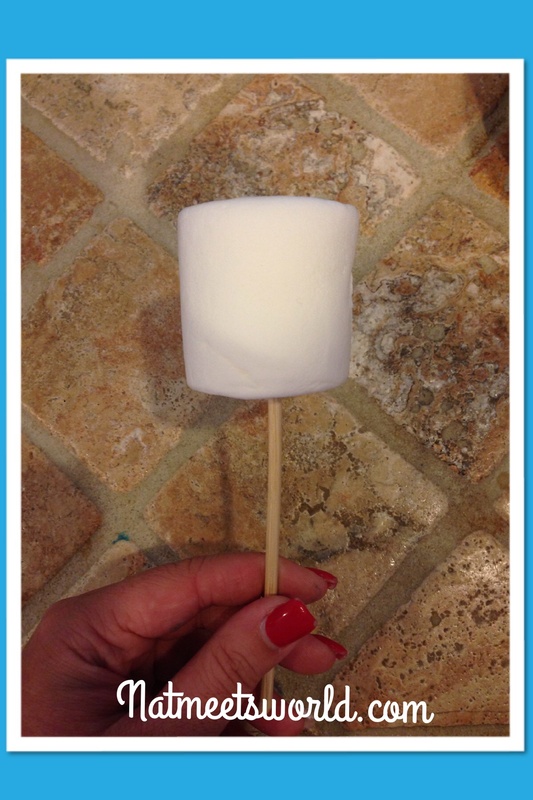 place your marshmallow on top of a white circle and press lightly on the top. Click the link below to watch me dip and press the marshmallows. Once you have repeated this step with all of your marshmallows, put in the refrigerator to harden for 10 minutes. Then, remove and place on top of your cupcakes. That’s it! 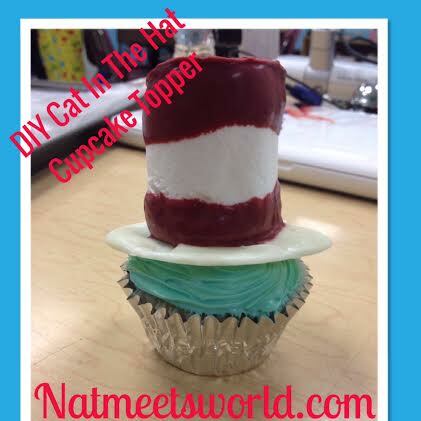 If you make them for a Dr. Seuss themed party, let me know how they come out!